Governor Terry Branstad suggests federal officials are afraid the State of Iowa’s version of Medicaid expansion will work and that’s one of the reasons the state’s request for waivers to run the program differently haven’t yet been approved. “The federal government, I guess, could do a lot of stupid things, but hopefully they’ll come to their senses and decide to work with us,” Branstad says. Branstad and legislators agreed to accept federal funding to expand the number of low-income, uninsured Iowans who qualify for Medicaid coverage. The plan calls for those recipients to pay a small monthly premium, but the State of Iowa has to get a federal waiver to collect it. Branstad met last week in Washington with a top White House official as well as the secretary of the U.S. Department of Health and Human Services. Branstad stresses the premium payment for a group of new Medicaid recipients will be refunded if the person takes steps to live a healthier lifestyle. 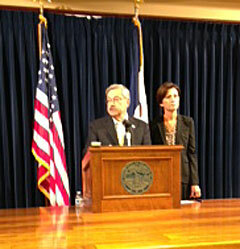 Branstad made his remarks this morning during his weekly news conference. Find the audio here.